It will be the biggest of freeways. Newsflash 14-August-2001: Funding for construction will be authorized on August 30, 2001. See the good news in the news report. 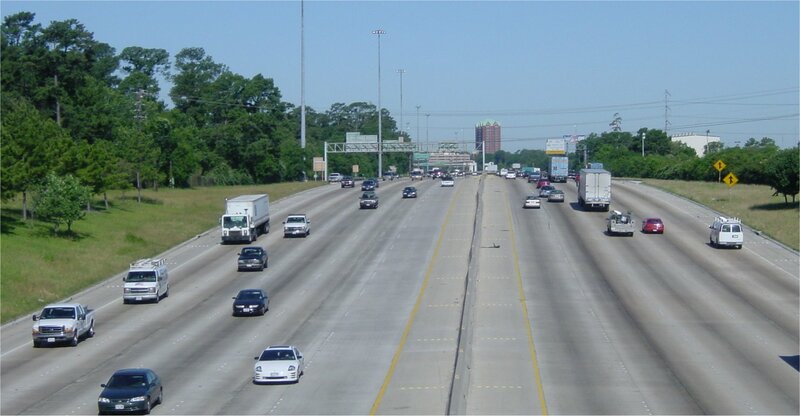 In 2001, Interstate 10 west is looking forward to Houston's largest freeway expansion ever, for possibly the nation's widest fully-paved freeway corridor for a sustained distance. For more details on the planned expansion, see the March 2001 Schematics. Construction will start in 2004. Today, Interstate 10 has two faces. The 10-lane freeway from downtown to IH-610 west, although opened in December 1968, is still modern and impressive by today's standards. It was recently repaved with new concrete, and has an impressive new HOV ramp near downtown. You could call it the best of freeways. The freeway west of Interstate 610 is another story. Mostly constructed in late 1950's to mid-1960's, it is an embarrassment to Houston. It has only 6 lanes, a center HOV lane which was built on the interior emergency lanes, and only four feeder lanes. The freeway carries over 200,000 vehicles per day, and traffic congestion is horrible. You could call it the worst of freeways. But Houston's worst of freeways will be transformed into the biggest of freeways. In March 2001, TxDOT presented its final design which it planned to submit for approval. But the Harris County Toll Road Authority is now proposing to participate in the project by adding a four-lane tollway in the center of the freeway. See the April 13, 2001 news report. So as of this writing on July 1, 2001, there is not a final plan of action. However, the corridor "footprint", averaging 475 feet, appears to be fixed. 1962 A 1962 road map shows the freeway complete from Bunker Hill to Post Oak. Mid to late 1960's The freeway is completed from Post Oak (IH-610) to Katy, Texas. December 28, 1968 The 10-lane freeway is opened from downtown to IH-610. 1989 The five-level stack at Beltway 8 is completed. This is Houston's first five-level stack. It will be demolished and replaced in the IH-10 reconstruction. 2000 The concrete on the section from downtown to IH-610 is replaced. 2000 The high-flying downtown HOV connector ramp is opened late in 2000. March 2001 TxDOT presents its final design for the expansion. However, changes are likely with the proposed inclusion of a tollway in the design. 2004 Construction is scheduled to begin. 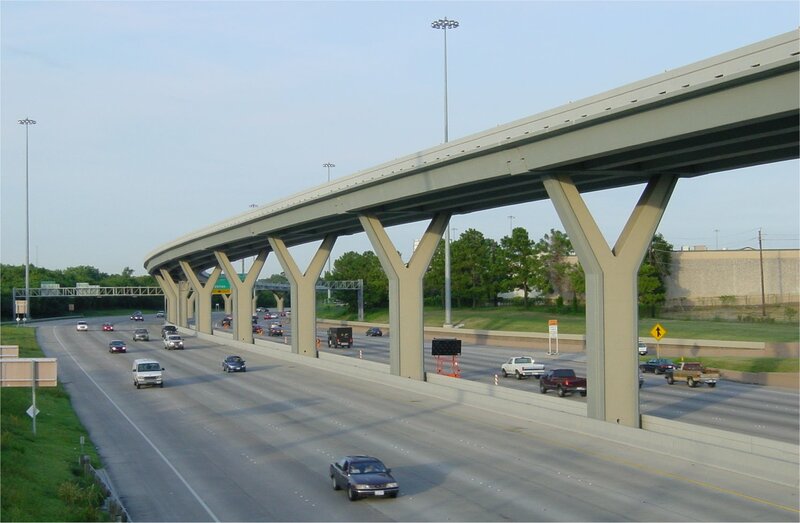 The first project will be the demolition and replacement of the 4-level stack at IH-610. 2006-2012 Project completion is dependent on funding. 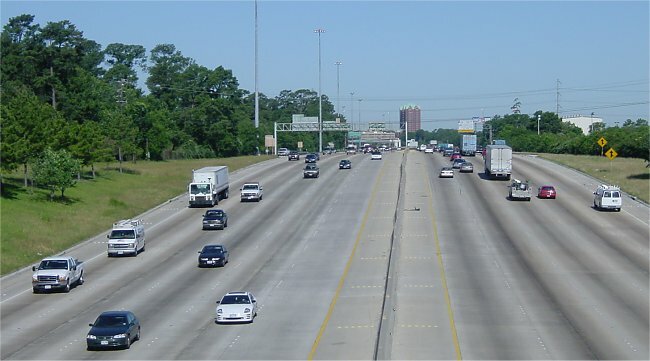 In the most favorable scenario, the Harris County Toll Road authority contributes up to $500 million, and the entire project is complete by 2006. In the least favorable scenario, the project is piecemealed as funding becomes available, with completion as late as 2012 or even later. Most likely scenario: completion around 2008 or 2009. (high resolution 177k) A. The new elevated HOV lanes along IH-10, opened in late 2000, which start west of Houston Avenue and proceed into downtown Houston, towering over the IH-10/IH-45 merge. Photo taken 20-July-2001. B. (high resolution 118k) Looking west along the 10-lane freeway just west of downtown Houston. Photo taken 22-May-2001. C. Looking east over the long depressed section of IH-10. TC Jester is the first overpass visible. Photo taken summer 2000, looking east. D. (high resolution 199k) A railroad crosses IH-10 at a 30 degree angle with the centerline of the freeway. This necessitated building a platform over the freeway. I always wondered: Why wasn't the freeway built over the railroad tracks. As explained in a 1966 article about the construction of this structure, there was a design preference to build the freeway below grade. Expansion plans will add feeder roads to this section of freeway. The feeder roads will go over the railroad tracks. Photo taken 22-May-2001. E. (high resolution 166k) Looking west along the freeway from the Washington Street overpass. Photo taken 22-May-2001. F. The 4 level interchange at 610 and I-10. This view looks east with I-10 at the ground level and 610 at the top level of the interchange. This interchange will be fully reconstructed to widen I-10 and most of the connector ramps starting in 2004 in a $59 million project. Photo taken September 2000. G. (high resolution 141k) This view looks west along the freeway from the Bingle/Voss overpass. This is the narrowest section of freeway. Look in the distance, and you will see just how narrow the corridor is. The expansion will take right-of-way from the north side of the freeway, including the YMCA shown in this photo. For more views of structures doomed by right-of-way clearance, see living on borrowed time. H. (high resolution 114k) Looking west along the freeway between Voss and Campbell, where the existing right-of-way is extremely narrow. There is no space between the main lanes and the feeder! Photo taken 20-May-01. J. Looking west along former railroad corridor on the north side of IH-10 near Bunker Hill. Near this point, the future freeway will have its widest cross-section, 530 feet. This right-of-way corridor and the Old Katy Road on the right side of the photo will be consumed by the freeway expansion. Photo taken 20-May-01. K. (high resolution 137k) Looking west along former railroad corridor and Old Katy Road on the north side of IH-10 between Wilcrest and Kirkwood. The railroad right-of-way and Old Katy Road will be consumed by the future freeway. The existing freeway can be seen at the left. Photo taken 20-May-01. L. (high resolution 121k) Looking east just east of Brookshire, Texas. This part of IH-10 crosses the Katy Prairie, a rice-farming area that also serves as a wintering ground for migratory birds. Environmentalists are trying to protect this area, but the prospects for protection are uncertain in "pave-everything" Houston. Fortunately for this strecth of IH-10, TxDOT owns the access rights along the freeway, so feeder roads will not be built. This should help prevent this far strech of IH-10 from becoming another commercial strip, which would definitely be good news. Photo taken 20-May-01.